Have you ever dreamed about exploring the furthest reaches of space? Fantasized about what it would be like to travel on a space ship like the one in Star Trek or to pilot one like those in Star Wars? What about being the captain of your very own ship? In this choose-your-own-adventure, a 344-page game book, you become the Captain of the Starship Traveller lost in the outer reaches of space. As you begin, taking the helm of the Traveller, a malfunction results in the starship and its crew being pulled into the gravitational field of the Seltsian Void, a black hole that thrusts ship and crew into an uncharted universe. After this opening salvo, you get to make your first decision to head toward a life-bearing system (straight ahead, to port, or to starboard) and begin your search for a way home. You get to explore galaxies, “beam down” to alien planets, and dock at space ports along with up to three crew members. You can pick your team from those listed on your Adventure Sheet (included in the book and determined before you begin) which include your Science Officer, Medical Officer, Engineering Officer, Security Officer, and two security guards (think “red shirts” who may be expendable). In the tentacled grip of a sentient plant? The story has the feel of an extended episode of Star Trek with you taking on the role of Captain Kirk. Your playthrough may include a visit to friendly or hostile planets. 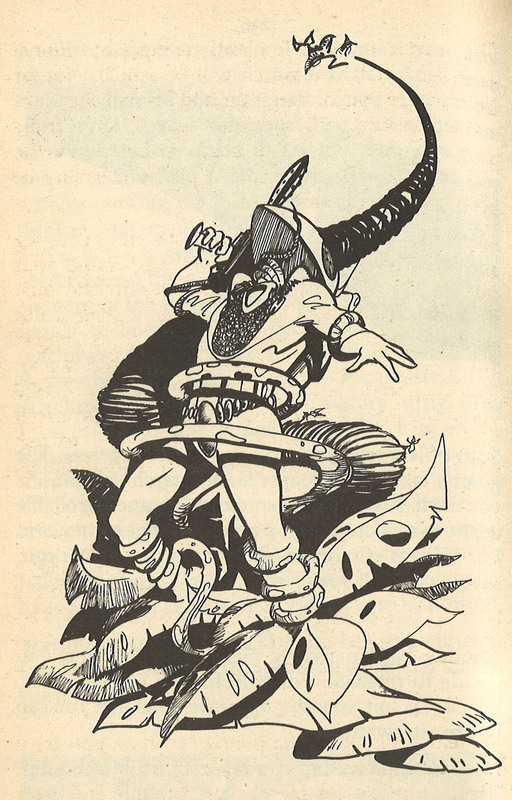 You may be involved in gladiatorial games, space port barroom brawls, and encounters with strange sentient creatures. You most certainly will have to make tough decisions. Leave behind crew members, determine the fate of dying worlds, or die. And good luck to you if you end up in the infuriating maze-like section that threatens to endlessly loop you into flipping between the entry numbers (keep track of the numbers!) until you think there’s no way out. Though combat (determined by roll of the dice) is present, it’s possible to avoid it on some playthroughs, depending on your choices. The overall goal of the game is to unearth clues to discover the path home. Again, jot down important numbers. Starship Traveller is not as epic as Jackson’s four-book fantasy series, Sorcery!, the pinnacle of choose-your-own-adventures, but it’s quite diverting for an afternoon. It would have been even more fun if it had been longer with more potential planetary visits, although there’s the danger of your crew getting anxious (or worse, despondent) and mutinying. The book was first published by Puffin Books in 1983. 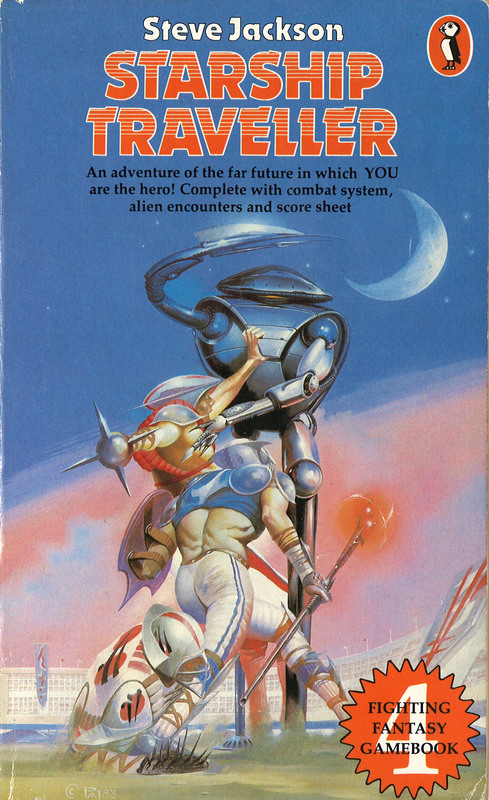 It was book four (according to the list of titles on the back cover) in a series of fighting fantasy gamebooks, but the first one to be a science fiction adventure. The cover and interior illustrations are by Peter Andrew Jones. I’d say the book is appropriate for ages 12 and up. It’s likely difficult to come by, except through used book stores and websites. However, Tin Man Games has released a digital version (for Android and IOS devices) of this and other titles. These books are wonderful, and are making a resurgence. I believe they’re starting to publish new ones! Check out Fabled Lands, which are making a comeback through Kickstarter, and can be obtained through Amazon. They’re the true pinnacle of Choose Your Own Adventures! 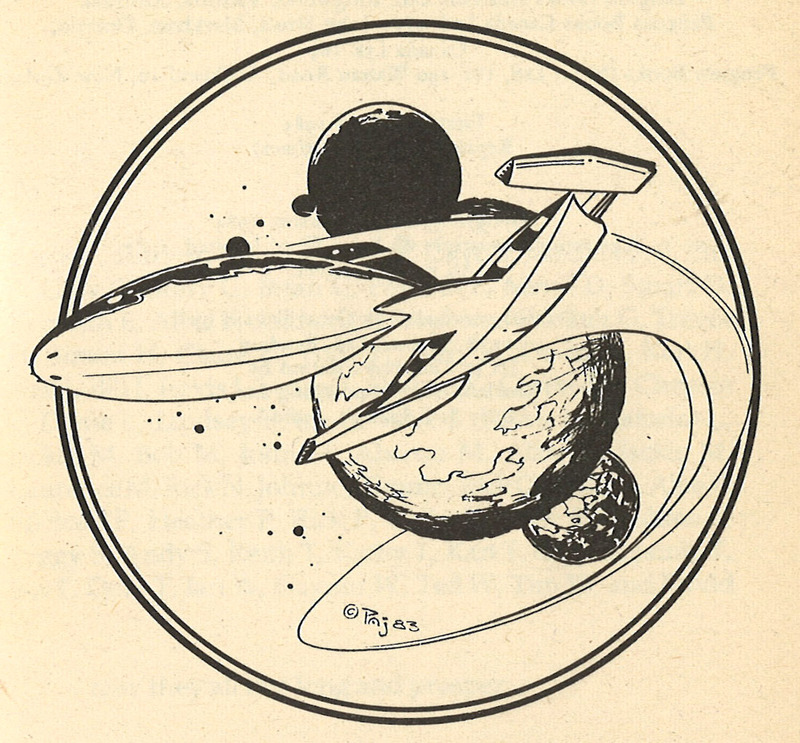 I really hated the illustrations for Starship Traveller. Apparently the iPod version has completely new ones, however. I had to check out the app () and wow! What an upgrade! In many ways, choose your own adventures were a presage of today’s apps. The app format is perfect for resurrecting these stories and expanding on the visual capabilities.